About 8 months ago I have done a couple of low cost and simple experiments to establish cold fusion. The experiments didn’t show any exceptional heat and the cause of the failures was easy to understand. The hydrogen atoms had to much freedom within the lattice and/or the electromagnetic manipulation of the hydrogen ions was not strong enough to lower the Coulomb force. However, doing the experiments again with the help of a palladium lattice isn’t realistic (far too expensive). Trying to find another type of lattice to keep the hydrogen atoms in a more fixed position isn’t simple too. So the most credible solution is trying to increase the density of the electromagnetic wave pattern of the free electrons. The image above (5) shows the “reactor” used in the last failed experiment. The lattice is a type of zeolite “clay” – clinoptiloliet [(Na,K,Ca)2-3Al3(Al,Si)2Si13O36·12H2O] – and the hydrogen atoms are part of water molecules (H2O) that fit the open volumes inside the zeolite. The zeolite powder is mixed with nickel powder to increase the magnetic flux – and hopefully the conductivity too – with the help of a high frequency electric current (skin-effect). 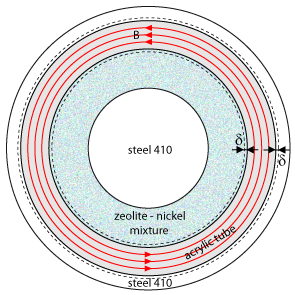 Figure 6 represents the cross-section of figure 5 to show the skin depth δ at the outer side of the nickel-zeolite mixture. Without the nickel powder there is hardly any skin-effect because of the absence of a magnetic flux, although zeolite is a semi-conductor for high frequency alternating currents. 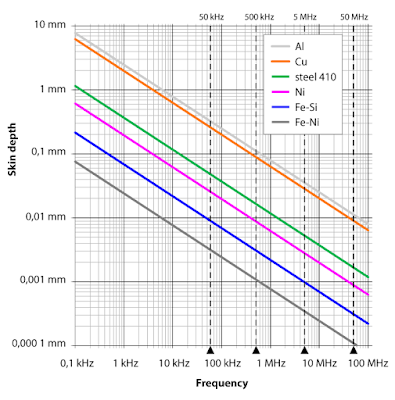 The graph in figure 7 shows the size of the skin depth δ for different conductors and frequencies. The frequency of the electric current used in the last failed experiment was 50 kHz (18 Watt transit power with a 0,08 V drop of the electric potential between both ends of the stainless steel thread). 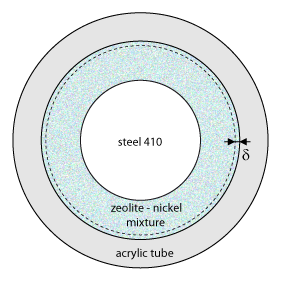 The graph shows a skin depth δ of ~ 0,025 mm when the acrylic tube was filled with 100% nickel. However, there was a 4 mm stainless steel 410 thread inside and zeolite powder too (mixture 60% nickel and 40% zeolite). So maybe the skin depth was about 0,05 mm (but probably more). 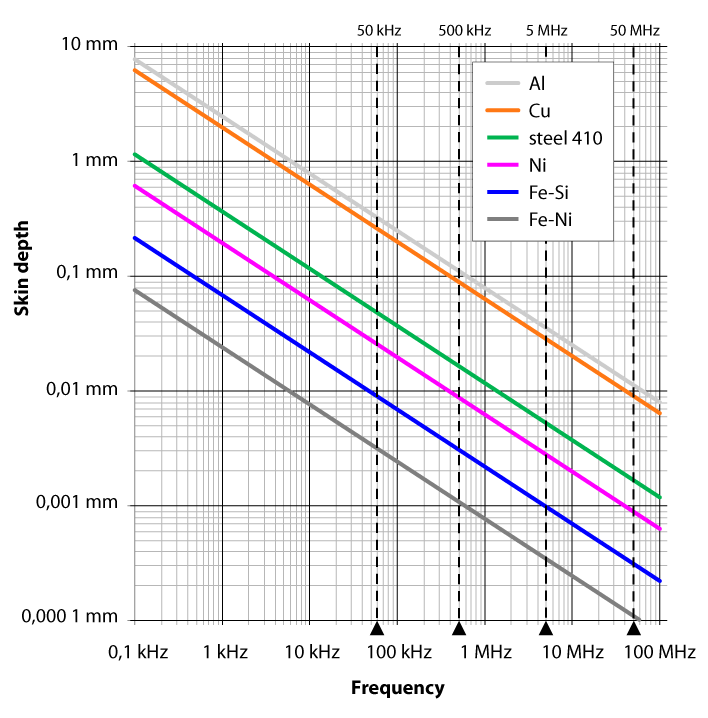 The graph shows the relation between frequency and skin depth. However, increasing the frequency has consequences because of the emitting of electromagnetic waves. When I want to decrease the skin depth substantial (e.g. from 0,025 mm to 0,0025 mm) I have to increase the frequency to 5 Mhz and now the reactor becomes a source of electromagnetic waves. So I have to decrease the skin depth without increasing the frequency too much. This can be done with the help of a second conductor. The image above (8) shows the influence of the electric current through a single conductor (like the reactor in the first image above). 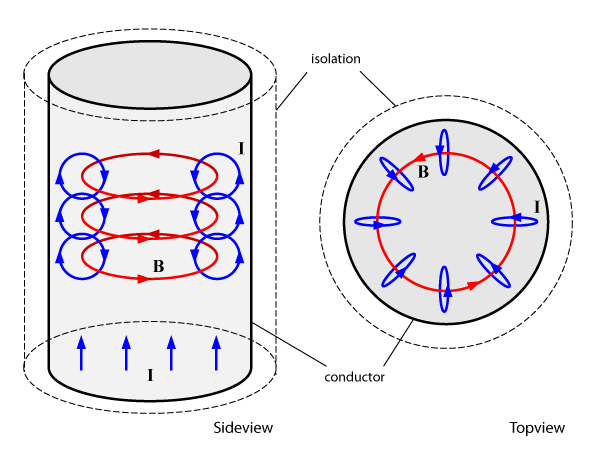 The result is a magnetic flux B (red) that creates circulating Eddy currents (blue), which forces the free electrons to the outside of the conductor. Figure 9 is the cross section in figure 5 and shows the situation when there are 2 conductors with opposite modulated currents (the second conductor is around the acrylic isolator). 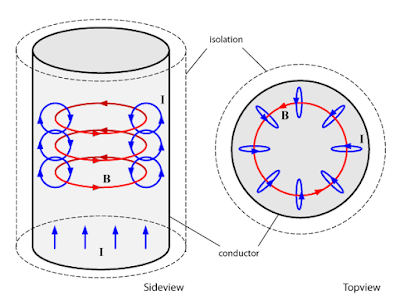 Both conductors have a skin depth δ but because of their mutual influence nearly all the magnetic flux B is positioned within the isolator between both conductors (the acrylic tube). The result is a further decrease of the skin depth in comparison to the situation with 1 conductor. A further improvement of the skin depth – the concentration of free electrons – can be done by changing the dimensions of the parts of the reactor. For example, an outer tube made of nickel, a thin wall of the acrylic tube and the replacement of the 410 steel core by a nickel core. However, without a positive result I have to conclude that zeolite with enclosed water molecules is not suited to get cold fusion in an easy way.